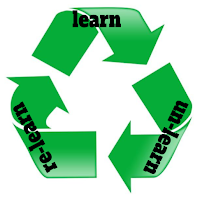 In today’s world, probably the most valuable tool we can teach our students is to “LEARN, UN-LEARN, and RE-LEARN”. I read that somewhere this past year and I wish I could remember who to give credit to because it is absolutely true! We want our students to learn from failure … to have grit … to problem solve … to be self-sustaining in their learning. I want to you really stop for a minute and hold up the mirror. I want you to really stop and think. Are YOU doing this? Are you willing to learn, un-learn, and re-learn? Or do you grumble about it … resist it … push back … even refuse to change? Let's focus this thought process a bit ... we profess we want our students to learn, UN-learn, and RE-learn. We want them to be comfortable with going out of their comfort zones and be willing to change … BUT how comfortable are YOU with all those things? - one program is replaced with a new one? - if you are asked to teach a different grade level or content? How do you respond? Do you put up barriers and excuses and fight the changes? I’ll be honest, change IS hard! There are changes I readily embrace but there are things I hate to see change. In the end, I remember I don't have to like the change but I DO realize my attitude and actions will pave the way for students and others to follow. I bring this up because Google Classroom is getting an update. Best estimates is it will go “live” in August. From what I’ve read from others, there might be some bumps in the road. The updates were announced at the ISTE Conference in Chicago in late June. (ISTE = International Society of Technology in Education) Some of these changes will be really, REALLY good! They involve adding a Classwork Stream for the organization of work … we’ve been begging for a better way to organize work (we were doing ok with the “Topic” feature, but we wanted more, right?). If your district manages your Chromebooks, you will be able to give “locked quizzes” … how awesome will it be to give a quiz and prevent the students from opening other tabs just by enabling a setting when you assign the quiz? Awesome! And there’s more. Coming up, I’ll jump in and show you some of the upcoming changes to Google Classroom. As of now, there’s no set date when these will go live, so keep watching. Also, right now it appears the changes might only appear in the newly created Google Classrooms. But knowing Google, they very well could push these through to previously created Google classrooms. Remember - Google is consistently great at several things, but they are fantastic about one thing … Changing. Updating. Reinventing. Innovating.